What are the differences between sprouts, shoots and microgreens? Moving to Greenville and discovering the diverse farmers markets has been enjoyable. However, I have discovered new food I had yet experienced. Sprouts, shoots and microgreens were once only popular in expensive restaurants, prepared by Le Cordon Bleu graduates…now, they are grown by specialty farmers and provide an enhanced flavor and texture to any home cooked dish. Once the new growth of a plant has formed from seed germination, this “up-growth” is called a stem, also knows as a shoot. Shoots have not yet developed a secondary cell wall, making them delicate, easy to chew and digest by animals. Photo of the shoot of a cucumber. Photo from Wikipedia. The new growth on a plant is the sprout, including the root, seed and shoot. There are strict regulations on the distribution of sprouts, due to the high risk of microbial contamination compared to other greens. Cultivated and sold by farms such as Upstate Greens, these are immature plants, usually only a few weeks old and ranging from 1″-3″ tall, including the stems and leaves. Cutting the stem, just above the soil, microgreens are harvested just after their sprout stage. Available in a variety of flavors such as, radish, mustard, brocolli and arugula, they provide an additional level of flavor to soups, stews and as a garnish. Unfortunately, microgreens have a very short shelf life. Because of oxygen and carbon dioxide imbalances, microgreens should be kept in a container that allows air movement. 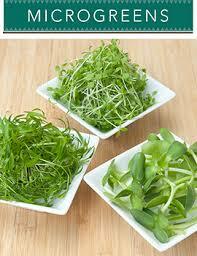 Best practice is to wash microgreens just before you use them, set them on paper towels to dry and apply to your dish. Best to use them within 5-6 days of purchase.